What Type of Watch Does a Nurse Need? If you're a nursing student, one question you may often ask yourself throughout various portions of your learning is "Will I actually use this?". When it comes to nurse watches, the simple answer is "Yes, definitely". A watch will come in handy when measuring apical heart rate, respiratory rate, for lab draws, and they are really handy when charting. Specific occurrences where you will need to quickly know the exact time are when reassessing pain, promptly delivering medication at the scheduled time, charting the time of a particular code, time when the patient left the floor, etc. 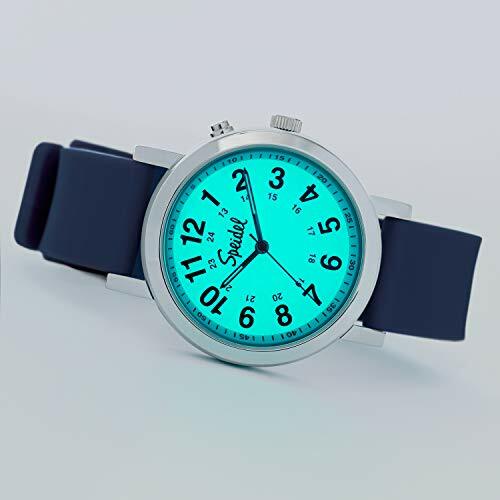 The Speidel Scrub Glow Watch fits the bill as our favorite pick. It is a simple but highly functional watch designed with the needs of medical professionals in mind. A reliable 3-hand Japanese quartz movement ensures reliability, while the white dial with black and red marks ensures that you’ll be able to spot the time at a glimpse. Ideal to use in all light conditions, this watch comes with luminous hour and minute hands which glow in the dark, while the dial also lights up at the push of a button. We also like the highly visible red second hand that is really easy to track for accurate pulse readings. Knowing that nurses wash their hands quite often, the manufacturer also incorporated water-resistant technologies. A stainless steel case resists splashes and even submersion up to 160 feet. Another important feature is comfort. It has a stylish, super-soft silicone band that feels great on the skin and is lightweight. Coming in a wide range of colors and easy to match with the color of your scrub, this is undoubtedly the best watch for nurses you can get your hands on. If you’re looking for a more affordable but still high-quality solution, check out the Casio Dive Series Sport Watch. This one is not designed specifically for nurses but serves this purpose brilliantly thanks to the large indicators. Its multicolor dial will not only help you keep track of the time; it also looks fantastic. The pastel-tone 12-hour indicators match with most scrub colors, while the minute markings are highly visible on the white background. A thing we like slightly less is the white second hand which requires a trained eye to be tracked with ease. This is only a minor drawback though, that can’t jeopardize all other qualities of this watch. 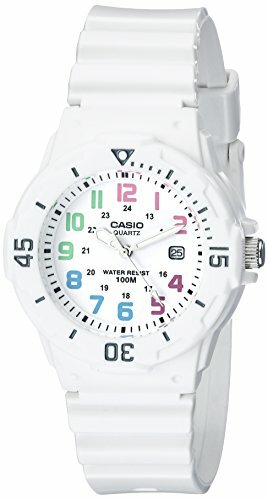 Like most Casio watches, this one has a utilitarian construction, it resists shocks, wear and tear, and it is ideal for diving – which basically means you won’t have to worry about washing your hands or showering while wearing it. Great for all nurses and coming at a price that won’t break the bank, this could be the perfect watch if you’re on a budget. Sleek and elegant, the Nurse Mates Women's Uni-Watch is a beautiful timepiece to wear on your wrist. It is designed specifically for nurses and comes with a large 1.5-inch case. Large numbers and minute indicators are easy to see on the white background, and so is the second hand. If you don’t like white, this wristwatch also comes in black, and even if it’s for women, its unisex lines and size can also fit a male nurse. Perhaps the best feature is the one-piece silicone band that adapts perfectly to your wrist size and stays fit throughout the day. We also like the sleek details this timepiece incorporates, such as the pink gold imitation on the rim. As you could expect from a nurse watch, this piece resists splashes. However, it’s prone to condensation. That’s not a major issue though, and the price can easily counterbalance this flaw. Colorful and joyful, this basic scrub watch by Prestige Medical will surely brighten up even your grimmest day. It has an attractive blue silicone band decorated with a dragonfly motif, but it also comes in other colors. What makes this watch different is the big dial that’s really easy to read. It comes with a plastic case and lens, two characteristics that boost resistance and durability. In fact, the lens resists scratches, and it doesn’t turn opaque over time. Like most scrub watches, this one has markings in both 12-hour and 24-hour format, while the second and minute indicators are also easy to see. It’s also greatly priced. The only thing to keep in mind is that it’s quite loud. Depending on your ward, this could or couldn’t be a deal breaker. 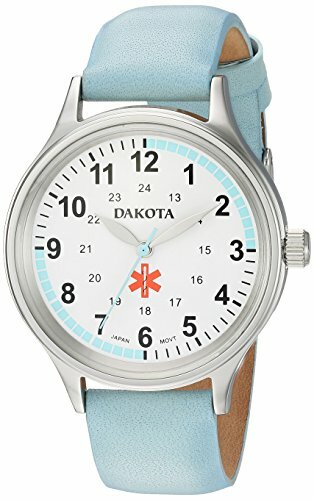 Anothre great brand on our list of the best watches for nurses is the Dakota Leather Casual Women's Watch. The brand is renowned for its quality watches, and this particular line has been designed specifically for nurses. This means you’ll get a 36-mm case, a 15-second quadrant pulse ring, as well as a colored second hand that is easy to follow as it moves. The Japan quartz movement ensures utmost precision, while the stainless steel back of the case keeps water out of the case. This watch is not only highly functional; it is also stylish. It comes in a range of pastel shades, although a white version is also available. A thing we like a little less is the leather strap, which is elegant, but it won’t withstand disinfection just as much as the silicone bands. 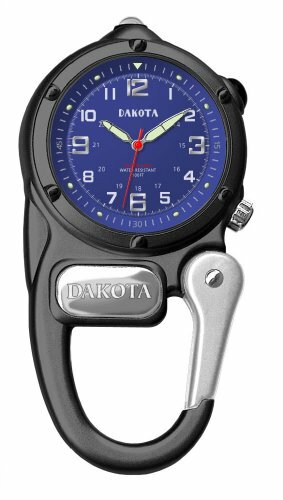 Considering though that this watch is designed to resist constant hand washing and even submersions up to 165 feet, this is undoubtedly a great watch for nurses. The Prestige Medical Nurse Watch looks professional and provides the perfect accessory to your nurse outfit. The watch is water resistant which makes it easy to wear when showering your patients or washing your hands, however it cannot withstand swimming activities. Its 10 inch screen features a 24-hour dial with an analog display, and a sweeping second hand. This nurse watch includes a buckle closure band made of gel with a 8.7 centimeters length which is suitable for most wrists. The band is flexible but does not come undone which provides extra comfort when wearing it constantly. Weighing in at 3.04 ounces, the timepiece is lightweight and does not add any bulk to your hand. The back case is made of stainless steel that ensures durability and good performance even if worn daily. Due to this watch not having any nighttime features, it is not a recommended product for night shifts. Overall, the watch is easy to clean and a durable purchase that performs well even after years of use. The material doesn't cause any irritation even to sensitive skins, which is a plus for shoppers suffering from allergies. Although made of plastic, the item does not have any smell. If you’re searching for a nurse watch with sweeping second hand this product might just fit the bill. This watch has a round dial, Japanese quartz movement, and an analogue display that tells the time in a 24-hour style. You can be sure the time will always be accurate. Its band is made of gel, therefore the risks of allergies are minimal. The metal pieces that touch the skin are made of stainless steel. You don’t have to worry about it coming undone and losing it either. People with bonier wrists might find it a bit uncomfortable to wear directly on the wrist. Most of the discomfort comes from the screws holding the back in place. It comes in 3 colors: black, pink and purple. Out of all of them, the black one seems to be easiest to read in all sorts of conditions as it has a white dial. The downside is that you always need some sort of light to see the hour because it doesn’t self luminate in the dark. This item is water resistant, and therefore not recommended for showering with it on, only washing hands. Should it get dirty, it’s easy to clean with some water and soap, as it won’t get damaged. 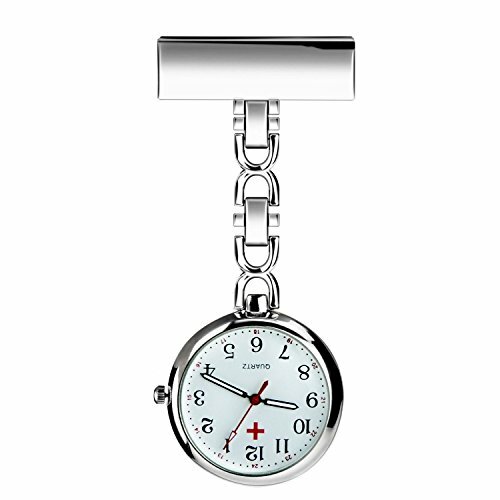 If you need a unique looking nurse pocket watch, this unisex item by Lancardo might be the one for you. The watch could also make a great gift for a friend as it includes a black velvet gift bag. 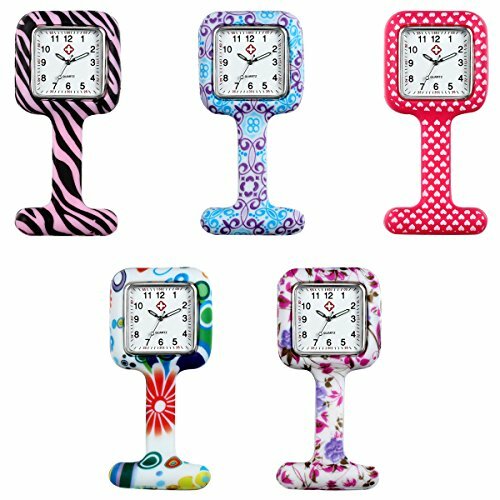 Available in 5 eye-catching colors, the nurse fob watch features a soft silicone case that is easy to remove and clean whenever needed. With a large, 1.63 inches screen and black Arabic makers, the watch is easy to read even in low light. Its fashionable appearance is enhanced by the unique design that features bubbles, hearts and flowers that will freshen up your day. Although it can stand water splashes and rainy days, this watch is not suitable for swimming or other water related activities. This item is unisex and has an analog display made of mineral glass. Designed with a safety pin on the back, the watch can be easily attached to any medical personnel uniform. You can adjust the band and remove the battery when needed, and the brand offers a 2 month money back guarantee if you are unsatisfied with your purchase. Resistant and lightweight, the timepiece is ideal for anyone who has a career in the medical field. The absolute cost of these lapel watches is a bit higher than most of the other watches we reviewed, but this is because you receive 10 lapel watches in the same package, each of which has its own unique design. The watches are made of silicone, which is pretty standard, but the actual watch component isn't anything special. The black hands and numbers provide good contrast on the white background, but the watch face is fairly small, so the numbers can still be a little more difficult to read. There also isn't any military time display or any backlighting or glow in the dark features, but it has all the basics you need to check the time or count by the second. These watches do have batteries that you can swap in and out​, but for all intents and purposes, we would recommend considering these watches as "disposable", with an undefined time span. The reason we say this is because the quality is a little lower, and therefore the durability is somewhat compromised (zero water resistance), so we wouldn't expect each of these individual watches to last overly long, especially if they receive some harsh punishment day after day. 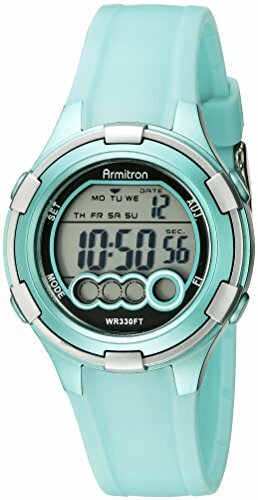 Overall, these watches are good for any nurse who is looking for high quantity at a low price (hard to beat 10 watches for $30-40!). If you need something that isn't worn on your wrist, but you're a little too worried about spending on something that might get ruined, this could be a great option, at least to start with until you figure out exactly what you need. While some may find it a hassle to always change watches, it can also be considered convenient to be able to throw away a watch with multiple more ready to go, especially for nurses! Not everyone likes analogue dials on watches. Most of the time, a digital nurse watch makes it easier to read the hour. Unlike the analogue models, this one will also show the day of the week and the date, but not the month nor the year. It’s also easy to read the hour in the dark as it has a button to turn on the light. Another advantage of getting this product is that you can wear it while swimming as long as you don’t go deeper than 330 feet. Its band is made of resin and the closure is made of steel, therefore you have little chances to get an allergy. Other nice features this item has are its dual time zone, upto 3 alarms and lap timer. Given its weight of 2.4 ounces, it’s unlikely you’ll feel bothered by it on your wrist. If you worry about how it fits, the band has many holes to help you make it as tight or as large as you need it to be. The instructions for setting it up as you need, are a bit confusing, but once figured out they’re easy to work with. This watch likely wasn't designed specifically with nurses in mind; however, it's functionality and appearance features make it more than a suitable option for any nurse or nursing student. The mini-clip design is similar to a carabiner, so you can clip it to different pieces of apparel according to your needs. 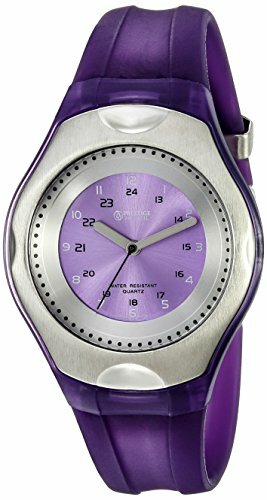 This watch comes in many different color schemes, but not all provide good enough contrast between the face of the watch and the hands and numbers. However, there is a bonus in that the dials and numbers are luminescent, which makes them easier to see in the dark. If you find color scheme with good contrast, then this combined with the luminescent hands make it a highly functional watch. This watch also comes with an ultra-bright LED micro-light, which can really come in handy when performing tasks in a patient's room during a night shift when they're sleeping. It comes with military time, and the entire watch is highly durable, as it is water resistant up to 100 feet and the alloy construction is a strong design. Overall, this is a highly functional watch for nurses that may appeal most to those who prefer something they don't have to wear on their wrists. 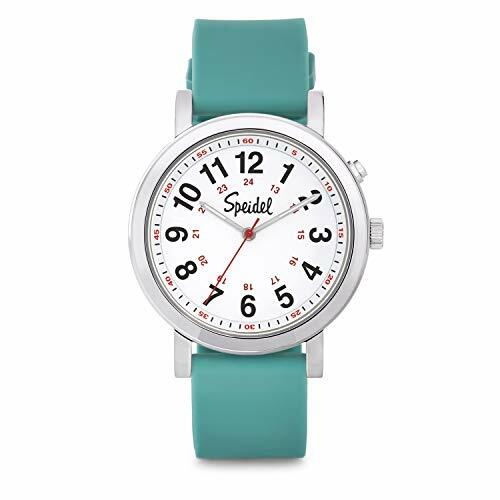 There are many different color schemes to choose from, all of which have a more sporty appearance than most other watches marketed towards nurses and nursing students. 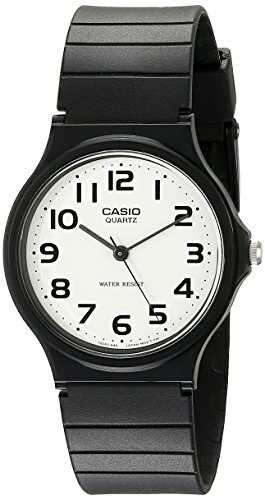 This Casio watch, while marketed towards men, is actually suitable for both men and women. Sometimes the classification between men and women is based on size of the wrist strap, but in this case, it actually runs a little small on lots of guys, and both male and female nurses have found it to be an effective watch for the job. We personally love the sleek black design. Black is slightly less common in the nursing world, but in this case, we find it a little more functional as it can hide some more subtle stains, and the face itself is no different from many other watches for nurses. The numbers on the face are really easy to see, as are the hands, but no military time display means you will have to continue doing the conversion in your own head. This watch is water resistant, but even still, we wouldn't suggest keeping it submerged in liquid. Splashes and spills should be fine though. The resin band isn't anything to really worry about in that regard, it's mainly that you don't want liquid entering the watch face and damaging the small inner components. Overall, this is a good all-around watch for nurses, especially if you prefer the black design. The design is sleek and simple, and the hands and numbers are easy to see, but the lack of military time is a bit of a disadvantage. This inexpensive silver watch has a safety pin allowing you to attach it to your pocket’s lapel so that you won’t lose it. It can be used by both genders, it’s very affordable and allows you to read the the hour in military style as well. The dial is attached to the pin by a short chain. Its dial is round, analogue and it tells the hour, minute and second. It has a quartz movement, so you don’t have to worry about winding it daily. With a width of 3.5 cm, a total length of 8.2 cm and thinner than 1 cm, you can easily tell this item is very discreet. At a weight of about 1.6 ounces, you can also tell it’s very light, so might even forget you have it on. While it will be safe to wash your hands with it on, it’s not recommended to submerge it. It’s best to make sure you pin it in so that’s easily accessible while not easy to fall off or to get hit against other items. This watch is also a good buy or gift for people nurses don’t like wearing wrist watches. 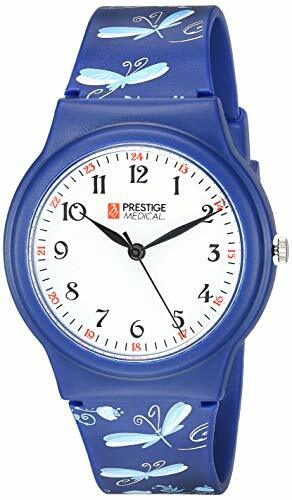 This is one of three Prestige Medical nurse's watches that we reviewed and we would recommend any of them for nurses. There are other watch brands out there that make similar style watches that function the same way, but getting something made specifically for nurses does instill a little more confidence in the purchase. This lapel watch is great for nurses who are required to perform more intense hand washing protocols, for example, those in oncology who need to wash very thoroughly further up the arms. This lapel watch is meant to hang of your clothes so you can simply look down (or flipping it up with your hand if necessary), and doesn't require removal for hand washing. The design is classy, but still more than suitable for a clinical setting, and the numbers for both standard time and military time are quite large. However, we find them a little difficult to focus on instantly, and we think this is due to the outline style with no fill, so there are a lot more lines to focus on. This is a minor complaint though, as they aren't impossible to see, it may just take an extra second to focus on an exact number. Overall, this is a great watch for nurses who are constantly washing their hands, especially when hand washing is of the up-most importance, e.g. in oncology. It comes with all the desired features and the appearance is classy, but we would take one mark off for the outlined design of the numbers (maybe others like this, though). 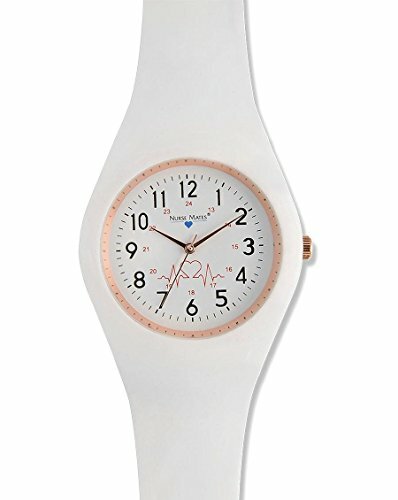 If you just got admitted into the nursing school, perhaps you’re confused about the necessity of getting a nurse watch. After all, what is really the difference between a regular watch and this type? Here is what you need to know. Analog: Are those old-school watches with a dial, hour and second marks, as well as hour, minute, and second hands. Although you could believe they are antique, the analogs are the best watches for nurses, and you’ll soon see why. Digital: These are a little more modern in appearance, and they might tempt you if you’re not used to reading an analog watch. However, you shouldn’t fall into temptation, especially if the display only shows the hour and minutes, but not the seconds. Smartwatches: The most modern type; these watches pack a host of features including smartphone connectivity and are simply awesome. However, when you can pick from dozens of functions, it could be hard to find the right one at the right time, especially when your patient’s life is at risk. Moreover, these are also overly expensive. Undoubtedly, the best type you could possibly pick is the analog. Your main goal must be functionality. You’ll often use the watch just to keep track of medication, but also to read the pulse or monitor other bodily functions. For the last two purposes, you’ll often have to watch the seconds passing by. With an analog watch, that’s simple. Just watch the second hand. Some digital watches may display seconds, but not all do, while smartwatches could be trickier to handle when quick monitoring can make the difference between life and death for your patient. Now that you know why to pick an analog watch, it’s time to find out what features to look for. Here are the most critical specifications to check. Dial: It is obvious the most important part of your nurse watch is the dial. It must be large enough so that you can see it without hassle, and it must have large hour numbers and minute/second indicators. Most nurses prefer a white background with black or colored symbols, but that’s completely up to you as long as the color choice doesn’t hinder visibility. It is also important to check the hands, mostly the second hand, which must be clearly visible on the background so that you can watch it with ease. Case: The case must be robust enough to resist wear and tear. As a nurse, you will probably have to disinfect it constantly, so that’s a thing to keep in mind when buying. Stainless steel case and glass lens is perhaps the most resistant option. Plastic is a good substitute if you’re aiming for a lighter timepiece, but if the lens is of poor quality, it can scratch and turn opaque over time. Band: We recommend you to steer clear from metal straps. They are heavier, could hurt your patient, and due to their construction, they are also harder to clean and disinfect. Your choices include silicone, resin, and leather; our favorite is silicone because it feels pleasant on the skin and you can soak it in disinfectant if you want to. However, all three types are great choices. Water resistance: While you don’t need a watch able to withstand submersions, it is essential to have one that resists splashes. Otherwise, you’ll have to take it off every time you wash your hands, and that’s not always possible or practical. Backlight: Depending on your ward or workplace, backlight could be essential. If you have to monitor patients during the night and don’t want to wake them up, glowing hands or a backlight could be a lifesaver. That’s especially true if you’re working in the maternity ward or with the elderly. Ticking: Another essential thing to consider is ticking. Some watches are very silent, while others are extremely loud. Which one is right for you depends once again on the ward, but also your preference. Some nurses find it easier to count the seconds if they hear the ticking; others find it annoying. Keep in mind though that a loud watch could annoy your sensitive patients too. Sometimes nurses will be required to measure the apical heart rate of a patient. For example, if a patient is known to have an irregular heart beat, measuring the apical heart rate can provide a much more accurate value. Furthermore, many procedures and medications require the measurement of the apical pulse prior to the procedure or delivery of medication, regardless of who the patient is. A clock will do just fine for this, as you simply need to count to a minute, but having a watch may be more comfortable, or reassuring if you're not sure where clocks will be present. Therefore, you don't need anything fancy in a watch in order to measure apical heart rate, just something that can count! Fortunately, we're all pretty familiar with watches and they are readily available. While watches are all quite similar, their specific features can make some better watches for nurses than others. These features include things like material, backlighting, analog versus digital, standard and/or military time, worn on the wrist or somewhere else, etc. We tried to address these features of watches for nurses up in our article. However, to get straight to the point, we have reviewed what we found to be the best watches for nurses. We tried to highlight different types at different price ranges, so you can have a good idea of what there is to choose from, as well as what watch is best for your particular nursing shifts.